Having a wife named Cindy who has a best friend named Cindy is tricky sometimes. Fortunately Cindy E still lives in Atlanta, for the time being. She's one of my wife's coolest friends and I hope she makes the plunge and moves back here once her tenure with the State Of GA is done. 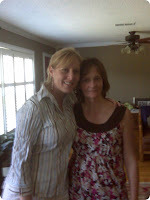 It would be fun to see her on the weekends, and Cindy (my bride) needs a good friend less than six hours away. Anyway, it was a brief visit, but I'm always glad to see Cindy E.
MindSpring Revisited - Ron Meinsler - 500th Post!